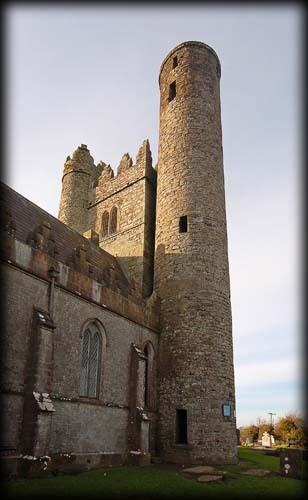 If I had not seen images of the round tower at Lusk before my visit I would probably still be searching for it. The round tower has been incorporated into the design of an early 16th century belfry. It is hard to imagine that you can disguise a 27 metre high round tower, but through ingenious design this has proved to be possible. The monastery which was founded here in the late 5th century by St Maccullin is also associated with St Maurus. The monastery was plundered and burned on several occasions during viking raids in subsequent centuries. Due to the surrounding ground level being raised up the doorway of the ninth century round tower is now situated less than a metre above ground level. Inside there are nine floors including the basement. These floors were added in the 19th century. 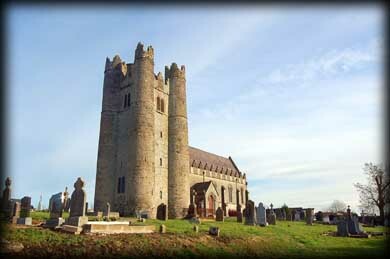 The relatively modern church was built against the east wall of the medieval belfry during the mid 19th century and now acts as Lusk Heritage Centre featuring an exhibition on Lusk and other medieval churches of North Dublin. There are numerous medieval tombs housed in the belfry. The centre was closed during my visit, I presume it will be most likely open during the summer months. Situated: Very easy. Head for the centre of Lusk . Park in the square on the main street. The tower is visible from here. Walk up the laneway to the church. Discovery Map 43: 0 2155 5455. Last visit Jan 2011. Features: The tower has been incorporated into a medieval belfry.